I remember one snow day in high school, not one snow day in particular, but one snow day in totality. That wasn't because we had to trudge to school in the snow no matter what, but because it doesn't snow in Portland. I took pictures of that one solitary snow day because that is what a huge deal it was. I remember one snow day in college too, again because it was such a big deal. It was in 2004 and the entire city shut down. It started with snow but then turned to treacherous ice. Gabriel had to go to a meeting across the Fremont and was stalled on the over pass, watching car and truck after car attempt to go over... but slam into the eastern facing side railing because it was so slick. I've been told the Farmer's Almanac predicts world wide this year to be the worst winter ever, maybe worse for those in -26° F Minnesota, but here it's a novelty and I call that best! Church was even canceled (Thanks Bishop!) and the missionaries were forbidden from driving or teaching. 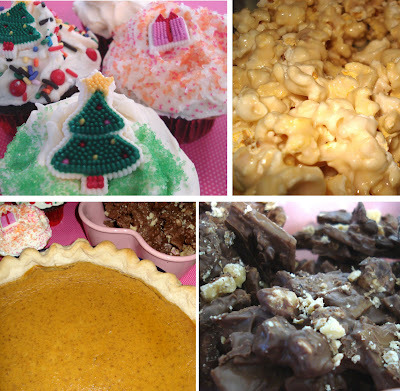 Fortunately we live across the street, and I got to play hostess while we enjoyed hot chocolate, marshmallow popcorn, cupcakes, butter toffee and pumpkin pie. You can find the recipe for Toffee at my sister Pamela's blog: French Knots although personally I prefer equal parts white sugar and butter; quite tasty. Stir until mallows are melted and pour over popcorn. Stir to evenly coat popcorn. Good luck keeping your sticky fingers out of this and pray for more snow here in Portland!